In honor of the Golden Gate Bridge's 75th anniversary, 16 artists have come together at Fort Point to present a unique collection of works honoring the color of the famed bridge. 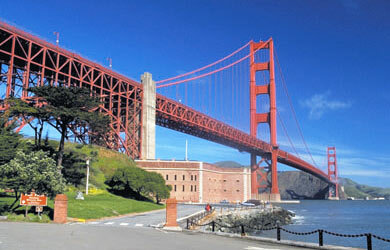 Fort Point was built in the 1850s to help guard San Francisco Bay. It quickly became obsolete and was used for a variety of other purposes before being decommissioned by the army. Today, Fort Point is a National Historic Site with a variety of interesting displays and activities. For the first time in many years, the fort will be open daily this summer from 10:00 a.m. until 5:00 p.m.
International Orange is a collaboration between FOR-SITE Foundation, the Golden Gate National Parks Conservancy, and the National Park Service. The 17 installations are set up throughout the three floors of the fort. My two favorite pieces are "Reveille" done by Cornelia Parker (right) and "Chrysopylae" (Golden Gate in Greek) by Doug Hall. Below is a photo of some of the 75 pieces of bunting designed by Allison Smith that adorn the railings over Fort Point's courtyard. I always enjoy visiting Fort Point, not only for its rich history, but also for its great views of the Golden Gate Bridge, San Francisco Bay, and the Pacific Ocean. International Orange runs through October 28, so now you have extra incentive to visit the old fort. If you would like to take a private tour of San Francisco that includes a stop at Fort Point, contact Blue Heron Custom Tours and Travel at (800) 326-4237 (toll free) or Rick@BlueHeronTours.com.